AyurvedicYogi » Ever wanted to clean your nose properly? Ever wanted to clean your nose properly? You may never have thought about cleaning your nose before, beyond blowing it now and again. But air pollution is a growing problem worldwide with increasing allergies, sinusitis and other health problems. We also eat mucus forming foods (dairy, breads, pastries, sweets, fatty fried foods, foods that are too greasy, sweet or salty) which also contribute to nasal congestion. Most of us take our noses and our ability to breath through it for granted unless there is a problem, but the nose is an important organ which is essential to health and well being. The nose is the gateway to the lungs, through which air is warmed, humidified and filtered before it reaches the lungs. Our nose is also our primary sense organ where receptors also have a crucial role in our ability to taste and distinguish flavours. 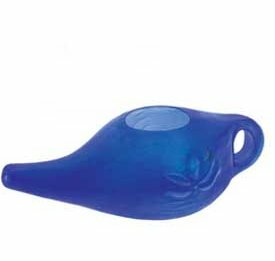 The neti pot a simple tool for nasal irrigation which is helpful to everyone. It has its origins in both Ayurveda and Yoga. If you suffer from headaches, congestion, painful sinuses and infections, using a neti pot is a simple and safe way to find relief. You may not like it at first, most people don’t! But if you persevere for a few days you will really feel the benefits. It can be compared with the feeling you get after swimming in the sea when salt water gets in your nose and cleans it. It will soon become as part of your daily routine as brushing your teeth. Before you begin, give the pot a wash in hot soapy water then rinse. Add a good pinch of sea salt and fill the Neti pot with it up to the rim with war water (ideally boiled from a a kettle). Swirl gently to allow salt to dissolve. Insert the spout into one nostril, making sure it fits snugly. Turn your head so the other nostril is downwards and tilt the back of the pot up slightly. Keep your mouth open and breath through your mouth. The water should now begin flowing out of the lower nostril. Maintain the position and keep the Neti pot tilted up until half the saline solution is used. At this point remove the pot, breathe in through your mouth, and blow the air gently out through your nostrils several times to clear out any remaining water and mucus. Repeat the procedure with the remaining solution for the other nostril. If the water does not flow easily repeat for that nostril. Once finished, blow the nose and then dry the nostrils fully by breathing in an out deeply several times, with the head tilted right and left. Ayurveda advises to put a little ghee, coconut oil or sesame oil in each nostril afterwards to help protect the delicate membrane and also pacify Vata dosha. If you skip this part, the body senses the nasal mucous membrane is drier than normal and produces more mucus! 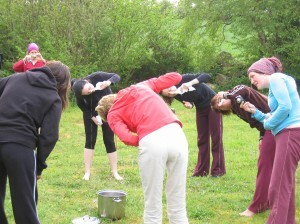 Neti can be performed over a sink, in the shower or outdoors. For first time Neti users the best place is probably over the bathroom sink in front of a mirror so you can practice the technique more easily. Neti is generally done once daily, but it can be done more or less frequently as needed. The best time is in the morning upon waking but it can also be done last thing at night to ensure easy breathing during sleep. You will also notice a great improvement if you practice pranayama or congestion is an ongoing issue. Good neti pot demonstration on You Tube at: www.youtube.com/watch?v=j8sDIbRAXlg. David Frawley has written an excellent little book called ‘Neti: Healing Secrets of Yoga and Ayurveda’. This includes information on how to add various herbs to your neti pot to Detox or treat specific conditions. You can purchase neti pots at Yoga centres or on-line. The nicest ones are ceramic, but a plastic one is handy for travelling.